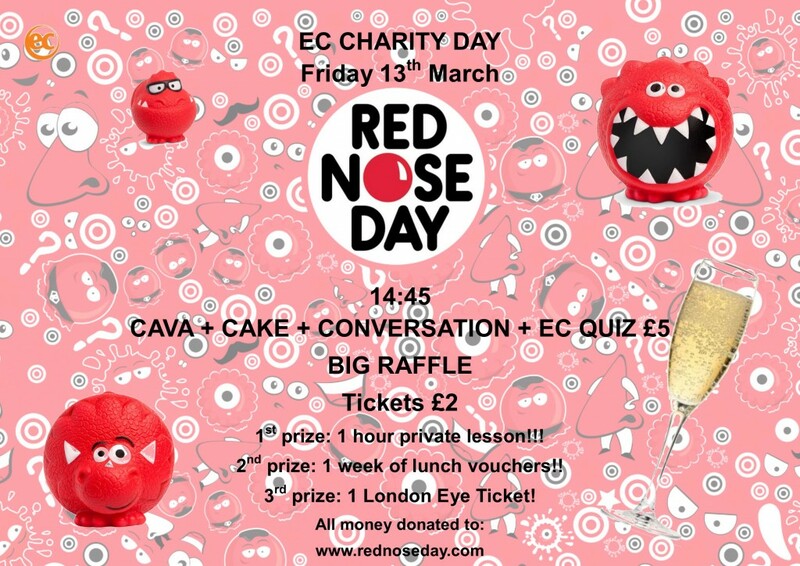 This week at EC Covent Garden school for Adult English courses we are organising an event for Comic Relief. We hope that our students will help us to raise money for this special charity, which is quite popular in the UK and everywhere in the city people work to help raise money for this organisation. The famous Live Aid concerts in 1985 saw rock ‘n’ roll royalty come together to raise awareness of, and money for, starving people in Ethiopia. Entertainers from the world of comedy were inspired by the success of these events and established Comic Relief to do a similar job using laughter instead of music. Over the following thirty years Comic Relief has become a biennial institution with millions of participants raising an impressive £1 billion for good causes in the UK and the developing world. Every penny of that £1bn. has gone to charities that help disadvantaged people as the administration costs of the organisation are all paid for by corporate sponsors. That alone would make Comic Relief a special charity, but what really makes it such an enduring success is its way of combining very serious issues with a light-hearted approach. People are encouraged to wear ridiculous clothes and perform ludicrous stunts in sponsored events that raise money for important causes. In this way the general public have come to see donating time and money as a positive, enjoyable thing rather than an onerous obligation. You can join in this celebration of silliness this Friday, the 13th of March. Put a few coins into our collection bucket, buy a raffle ticket or put on a red nose –the symbol of Comic Relief- and get your fellow students, who are taking Adult English courses at EC Covent Garden, to sponsor you to keep it on all day! If you to come to London for Adult English courses in the UK please visit our website!